A series of regular reports by IBM's Digital Analytics Benchmark group, tracking a "digital analytics platform that tracks millions of transactions and analyzes terabytes of raw data from approximately 800 retail sites nationwide," profilied the week's shopping by mobile users. IBM highlighted that buyers' use of mobile devices for shopping was up 9 percent over last year, and that mobile devices now account for 37 percent of all shopping traffic and 21 percent of online sales. In general, smartphones drove twice as much traffic as tablets, but tablet users actually placed 1.5x as many sales, accounting for 13.2 percent of online purchases compared to just 7.8 percent for smartphones. 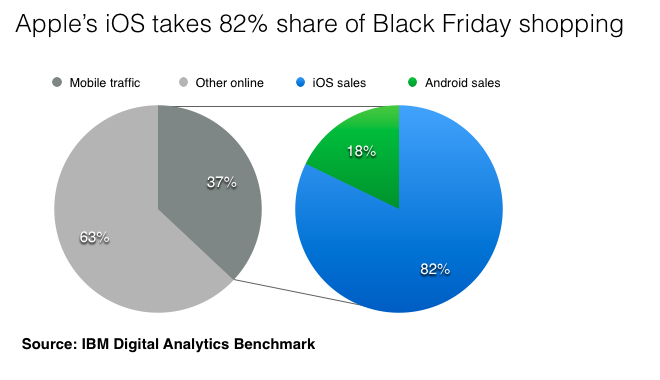 However, when breaking down those numbers by mobile platform, IBM reported that iOS devices accounted for more than 4.5 times the total sales of Android or over an 80 percent share of mobile-oriented sales (above), with 17.3 percent of all online sales occurring on an Apple mobile device versus just 3.75 percent on Android products. IBM stated that iOS users also spent an average of 18 percent more per order: $131.34 versus $111.35 for average Android sales. Apple's iOS devices also made up 26 percent of all overall mobile traffic, compared to just 11 percent for Android. Microsoft's Windows Phone, BlackBerry and other mobile platforms didn't represent enough activity to mention.